Figure 2.10. Energia was an approach to achieve a fully reusable (all major components recoverable), extended-life launcher (at least 50 launches without overhaul) with a Saturn V heavy-lift capability that the United States discarded. Right side shows strap-on booster configurations and payload to LEO. Energia M was in development in 1990.
new. The Buran center tank has a very low ballistic coefficient, and using a Lockheed concept to reduce the heating with the thermal and antistatic coating applied to the booster, the entry into the atmosphere could be relatively easy. The center tank did a fractional orbit and was recovered in the vicinity of the launch site. Although never implemented in the first two test flights, the eventual operational capability planned was to recover all major components. Said otherwise, Energia was to be the USSR's fully recoverable Saturn V. The booster configurations on the right side of Figure 2.10 show the payload to LEO for the different strap-on booster configurations. For the four pair configuration, the payload was carried in tandem with the center tank in a special powered stage. For the two pair configuration, two payloads are shown, the canister and the Buran. 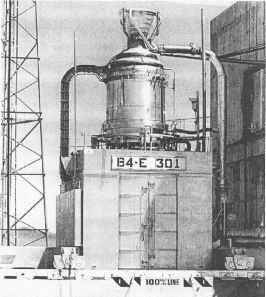 The Energia M was a two strap-on booster arrangement for a lesser payload. The author saw Energia M in the Energia assembly building in 1990 (there is no reported flight of this version). Note the intended fly rate from three launch complexes: 1800 flights in 20 years, for an annual fly rate of 90, about the same as from the Soyuz launch sites. If the cost is the same for Shuttle, $US 1.32 billion for five flights and $US 100 million for each additional flight, then with a mix of Buran and canister payloads, the payload cost to LEO is in $US 450 to 650 per payload pound. So frequent flights of cargo-configured vehicles lowers costs: the Energia would have been a wise investment. The Russians thought very highly of Saturn V, and were dismayed that the United States would summarily discard a heavy-lift vehicle capable of lower cost to orbit (about $US 5700 per pound payload in the 1980s) than the Space Shuttle. Figure 2.11. 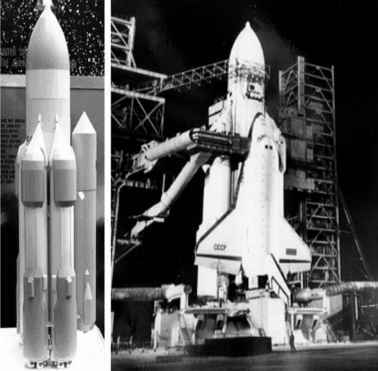 A model of the "Energia" showing the strap-on booster parachute packs and cylindrical payload container (left) and the Buran space plane on the Baikonur launch complex (right). The RD-0120 engines are on the center tank, which is recoverable. Figure 2.12. Fly-back version of the Zenit strap-on as an alternative to lifting parachutes. to Buran. The angled tube is an escape path to an underground bunker, in the event of a launch mishap. The two horizontal tubes in the lower part of the figure are ducting that lead to the rocket exhaust chute under the vehicle. These are attached to eight vacuum cylinders on each side, equipped with compressors and a vent stack. When the hydrogen flow is initiated to the rocket engines, this system is opened and any vented hydrogen is drawn off, compressed and burned in a vent stack. The original design was to construct three launch sites in close proximity, so that nine Energia/Buran and Energia/canister configured vehicles could be launched within three days in case of a Space Shuttle/Star Wars attack. None of this was ever accomplished. The Russian Space organization wanted also to replace Proton with a reusable vehicle. When the author visited Baikonur in 1989 there was an Energia M being assembled that has just two Zenit strap-on boosters instead of four. It was their intent to make this the medium-lift launcher replacing Proton. 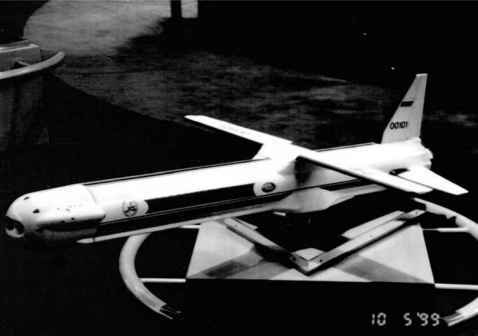 With the side payload placement Energia M could accommodate a payload canister or a smaller hypersonic glider, such as a crew rescue vehicle based, for instance, on the BOR vehicles. Figure 2.12 shows a modification to the Zenit strap-on booster so that it has a skewed-axis wing instead of four sets of lifting parachutes (Figure 2.11) and a turbojet with a nose inlet in the front of the booster for a powered return; it was shown in an American Institute of Aeronautics and Astronautics technical meeting in 1992. For readers who may wonder, ''Buran'' is not a US Space Shuttle, or a copy of it. Its intent is very different. The author visited the Buran II assembly building at Baikonur in 1989. The glide angle of attack for maximum lift to drag ratio is 10° to 15° less than the US Shuttle. Buran is a fully automatic vehicle with a neural network-based control system. It landed for the first, last and only time at the specially constructed runway at Baikonur without any human intervention. This took place during a snowfall and with significant 90° crosswind; it touched down within a few meters of the planned touchdown site [Buran Site Director, 1989]. As with all Soviet spacecraft, it was never intended to be controlled by human pilots, except in a dire emergency. Its thermal protection system was (and still remains) unique and capable of handling lost surface tiles without damaging the airframe structure [Neyland, 1989]. The reported maneuver Buran did on landing was much discussed in a 2002 article in Air & Space but it was not a poorly executed automatic landing: in fact, it was strictly the result of the neural network flight-control computer developed by the USSR Academy of Sciences, Siberian Branch, in Krasnoyarsk in the 1980s [Bartsev and Okhonin, 1989] and built by a company in the Ukraine. The flight-control system had determined that in the entry, the actual lift to drag ratio (L/D) had exceeded the estimates used in the pre-planned flight trajectory. As a result, the aerodynamic heating Buran encountered during re-entry was greater than expected, and so are now its control surfaces, because of the deflection required to trim Buran near to its expected L/D. So, Buran entered the approach pattern much faster than anticipated. If Buran was to land successfully the excess speed had to be bled off. The neural network controller, without any input from ground control, executed a 540-degree turn, rather than the planned 180-degree turn, to bleed off the excess speed [Lozino-Lozinski, 1990]. Then, Buran touched down on its planned landing point with the correct speed. Figure 2.13. 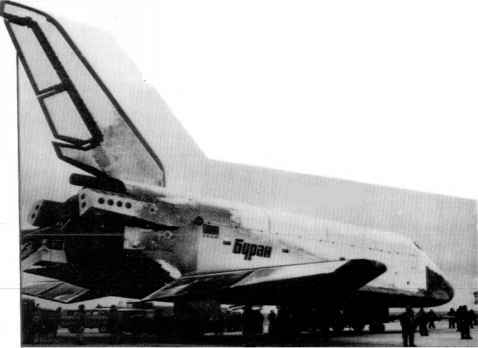 Buran after landing on its first, last and only flight. Note the vortex heating emanating from the juncture of wing and fuselage. This matches the thermal mapping test at TsAGI, and proves the angle of attack was sufficiently low that it did not burst, as it does on Shuttle. The burned spot on the inboard elevon is the vortex core location. the vapor from the phase-change material to escape. V. Neyland, one-time Deputy Director of the Russian oldest gasdynamic center TsAGI, tested this strategy in one of TsAGI wind tunnels (one of these authors has a copy of the data report [Neyland, 1990]). The thermal protection tiles the Buran employed are structurally strong. During a 1989 visit to Russian research institutes, at Komposit OKB, the author (PC) saw a Buran tile heated to white heat with an oxy-hydrogen torch and then dropped into water, with no damage to the tile. The Buran tiles were intentionally gapped with plastic spacers and were mounted with the unique adhesive described above, that acted as a thermal safety layer. So, at the beginning of 1990, Russia had the hardware in test for a family of fully recoverable and reusable rocket-powered vehicles for medium and heavy lift. Ten years later, by the beginning of the 21st century, neither the Unites States nor Russia had a heavy-lift launcher on the order of Saturn V any longer. Shuttle was limited to about 11 tons, and Proton was probably in excess of 20 tons. Thus with both the United States Saturn V discarded in lieu of the Space Shuttle, and the demise of Energia, unfortunately there is no longer an affordable heavy-lift launcher available to either the United States or the Russian Republic.